More consumers are turning to Android-powered devices and research firm Gartner believes this OS will overtake RIM for the number 2 spot by the end of the year. 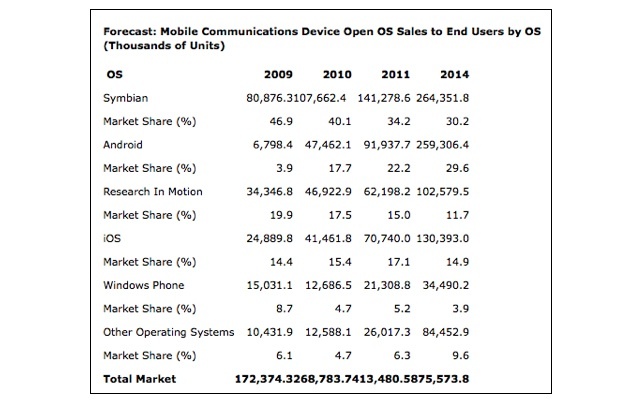 Still leader the OS charge is Symbian but again Gartner states that Android will come close to being the worldwide leader by 2014. Many manufacturers are releasing more devices with Google’s Android OS. Samsung, Sony Ericsson, LG, Motorola and Acer have all hopped on board, which Gartner thinks will “help Android become the top OS in North America by the end of 2010”. What’s more interesting to note is their viewpoint on Microsoft’s upcoming Windows Phone 7 OS. Rumours have this launching in October and by the end of the year have a 4.7% market share, followed by 5.2% in 2011 then dropping to a low 3.9 by 2014. In addition, Apple iOS looks to be taking on 3rd spot by 2014 with 14.9% market share and RIM falling to 4th with 11.7% market share. Time will tell, all speculation until the manufacturers release actual numbers.